Reese Caster, a single surgeon who’s known as a ladies man is propositioned by his friend Joey Tillman, but the catch is Joey has been dead for a year. 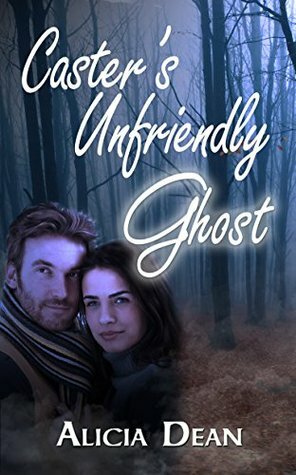 I really enjoyed Caster’s Unfriendly Ghost. It was a entertaining quick read. I like the writer’s writing style. She had a subtle way of describing the characters and her description in delivering the setting were masterful. The characters are captivating and the plot intriguing. This was a book that kept my interest through out. The characters were good hearted and a pleasure to read about. They had lucrative careers but found pleasure in volunteering in helping raise money for charity in putting on their annual haunted forest. Joey’s soul can’t rest until his wife finds happiness; this brings about his proposition to Reese. The guy that Emily is dating is up to no good, so Joey calls in Reese, who happens to have broken Emily’s heart many years ago, to scare away the new guy. With a twist of his arm Reese finally accepts and agrees to help Joey. A question I asked while reading the book was: is Joey able to handle the outcome of what he put into motion? This is the kind of book that I like that leaves something until the end so you can’t figure everything out before you get there. You know it will be a happy ending, but the author gives a little twist that makes the reader say … oh, clever thinking. It’s obvious the love that Reese and Emily shared in the past didn’t stop when the relationship ended. They share an attraction between each other that is so obvious. Emily is quite a lucky woman to have such good guys looking out for her. I found this book to be happy, but also a pinch of sadness. Love in it self can be complex but add in friends, ex-lovers and old feelings it’s a mix that is sure to bring about a satisfying read. This is a highly recommended book for any reader that is looking for a easy satisfying read.